The Astronomy Within Reach book contains several references to this website. These references are listed below. This video shows a few weeks of sunspots forming, dissipating and moving with the Sun’s rotation. At the time of writing, this 22-second animation called ‘Moon wobbles in NASA animation.mp4' was available on YouTube. If it is no longer there, it is available here. Click here to go to the Portable Solar System Model webpage. There is a great utility program called JupSat which displays not only the side-on view in real time but also the plan view. The latest version costs $25, but the free version for Windows 95 still works fine, in XP at least. It does not have all the features that the latest JupSatPro has, but provides the basic information we require. It can be downloaded here. See an explanation of the techniques used to see Venus with nothing but your own eyes below the following table and find the dates in the table. Azimuth = compass direction (where North=0° and East=90°), Elevation = altitude above horizon, Sun Angle = angular distance from the Sun, Venus/Moon Angle = Angular distance between Venus and the Moon, Moon Phase = percentage of Moon illuminated. 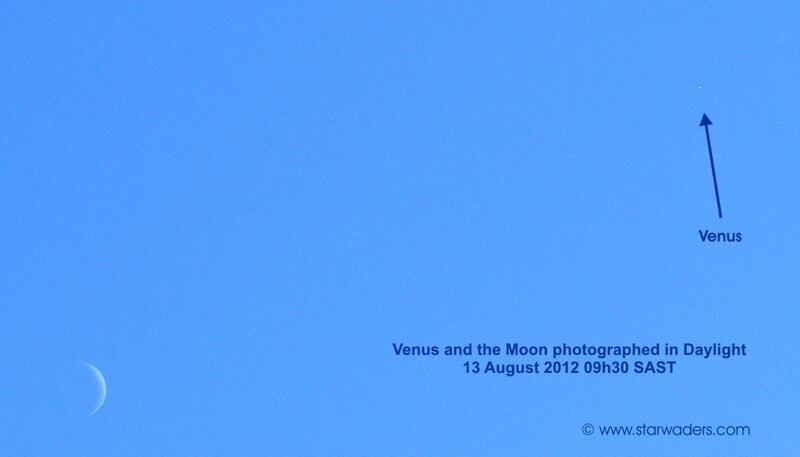 Under the right conditions, YOU can see Venus in the broad daylight with your unaided eyes against a bright blue sky! Many years ago I spent some time releasing and tracking weather balloons through a theodolite lens. On one occasion, a star like object appeared in my field of vision as my view swept across the sky even though it was daylight. I noted the theodolite coordinates and soon returned to that position. It appeared to be very high in the sky and because it did not move much during the next 45 minutes, I presumed that I had spotted one of the huge high-altitude weather balloons. I could clearly see the sunlit crescent on the one side, just as our half Moon appears to us. Had I known then what I have learned since, I would have realised that I was watching Venus appear to move from East to West while I was taking a ride from West to East on Earth's surface! And yes, Venus did look like a huge sphere sunlit from the one side because that is exactly what it is. Without optical aid, the crescent shape of Venus cannot be seen, but it can be seen as a very bright spot. There are a number of factors which improve the chances of spotting this daylight planet. Your eye has a natural relaxed focus a few meters away. To focus closer, the eye muscles must pull the eye lens into a tighter curve. As one gets older, the tissue in the eye becomes stiffer thereby limiting the closeness of a focussed object. The remedy is long arms and when that no longer helps reading glasses are needed. The eye muscles also have to work when looking into the far distance. Now they have to flatten the eye lens. In order to focus, the brain needs to see something, but in the clear blue sky there is nothing clearly visible to focus on. Venus is a tiny point of light during daylight and it cannot be seen if the eye is not focussed at the furthest distance, i.e. infinity. In between looking at what is apparently a blank blue sky, briefly flick your gaze every few seconds to an object on the horizon or even onto a tree a hundred meters away. This pulls the eye lens into long distance focus. You could have been looking directly at the point where Venus was and not seen a thing, but having nudged your eyes into infinity focus, be totally surprised to see the bright Venus diamond suddenly become "as clear as daylight". You will wonder why you could not see it before and why others around you cannot see it. The atmosphere is usually easiest to see through in the morning hours. City pollution and even dust in the countryside inevitably add a haze as the day wears on. This means that Venus should be in the morning sky, having risen well before the Sun, to improve your chances of seeing it in daylight. Note that having risen well before the Sun means that Venus will have been brightly visible in the night sky before dawn. Knowing where to look in the sky is the biggest hurdle in finding Venus during the day. Wouldn't it be great if there was someone with a huge pointer who could show you where to look? Well, occasionally the Moon passes conveniently close to Venus to act as that pointer. By knowing when Venus rose before or after the Moon did, you can then look either in front of the Moon (to the west) or behind the Moon to find Venus. But how far in front or behind? Our sky rotates 360° overhead once every 24 hours which is to say 15° every hour. If Venus rose 1 hour before the Moon did, then it will be leading the Moon in the westward passage across the sky by 15°. So, how much is 15°? On the outstretched hand, from thumb to the little finger tip covers about 20° while a fist covers about 10°. So, rising an hour before the Moon, Venus would be leading the Moon somewhere further than a fist distance away and less than an outstretched hand away. Remember that the Moon itself is only ½ a degree wide, so 15° is quite a distance away. The closer Venus is to the Moon, the easier it will be to spot. 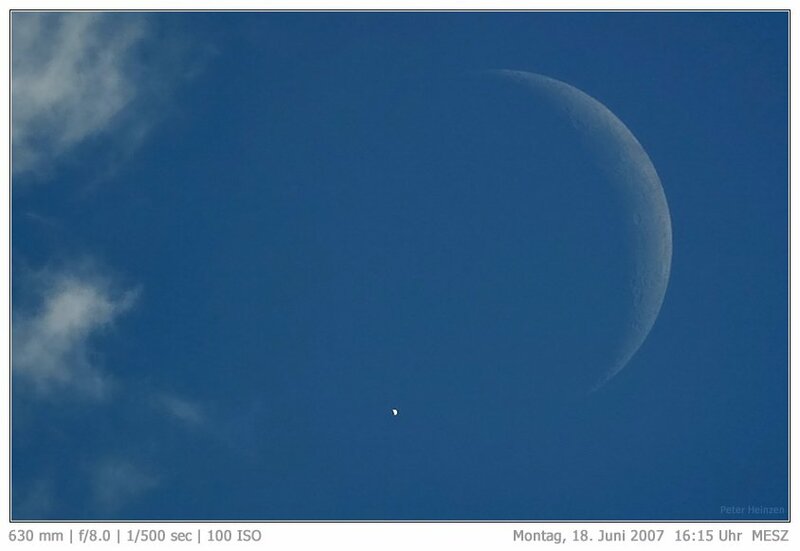 Venus is not always trailing or leading the Moon along the same track, so even if the Moon rises shortly before Venus or Venus rises shortly before the Sun, Venus might be some way to the North or South of the Moon. It is only when the tracks of Venus and the Moon run with a few degrees of each other that the Moon can serve as a guide to Venus. Not only does the Moon provide a pointer, but it also gives your eyes a distant object to focus on. Binoculars make it easier to find Venus in daylight, BUT TAKE GREAT CARE not to inadvertently look into the Sun. You will suffer permanent and irreversible damage to your eyes! Remember that the amazing object of this exercise is to be able to see Venus in daylight with your own precious naked eyes! If you do use binoculars to initially find Venus, the best way to prevent yourself accidentally looking into the Sun is to stand in the shade of a wall or building where it is IMPOSSIBLE to look directly at the Sun but from where Venus and the Moon are still visible. Taken by Neville Young from Pretoria with SONY DSC-H10, Speed 1/320 sec; Aperture 4.0; Focal Length 19.8 then edited using XnView to bring out contrast. Venus is visible to the naked eye as a clear, sharp, sparkling diamond. See Astronomy Within Reach page 76 . Sien Sterrekunde Binne Bereik bladsy 76 vir verdere inligting. Here is a photograph taken by ' mannunshesh mekenok' or in English 'Go Slowly Turtle' or known to the guys at the Pretoria ASSA as Mike Haslam. Note how Mike is 'upside-down' . He sees Venus to the left of the Moon!